Ottawa has come down with a case of Will & Kate fever this week as the Duke and Duchess of Cambridge are in town for Canada Day celebrations. It reminds me of the time another famous Duke and Duchess visited Ottawa, and I got to spend a few minutes with them. Way back in July of 1989, Prince Andrew and the Duchess of York (aka Fergie) were on an official visit to Canada and stopped in Ottawa for a couple of days. Jeanne Sauvé, the Governor General at the time, was hosting a dinner for them at Rideau Hall and needed some after-dinner entertainment. Madame Sauvé had attended a performance by my percussion ensemble in Kitchener earlier that year, and she decided that we’d be an interesting choice. We were excited to receive the invitation, and a couple of weeks later the twelve of us filled up a truck with our gear, loaded up the 15-passenger van, and headed for Ottawa. 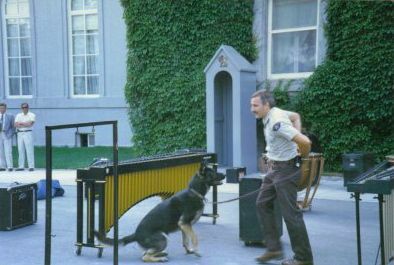 When we arrived at Rideau Hall, we had to unload all of our percussion equipment onto the driveway so the RCMP and their dogs could check everything out. I can only imagine what the security protocols are nowadays. 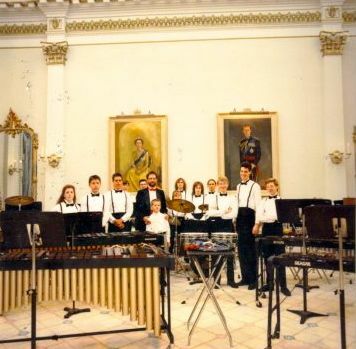 Once they decided that this rag-tag group of high school percussionists posed no real threat, we were allowed inside to set everything up. It was by far the fanciest room I had ever played in. The dinner seemed to go on forever. Eventually word came that the guests were on the way, and we nervously took our places. It was pretty cool to see Andrew and Fergie sitting just a few feet away. They looked a little tired by that point, and they jumped a bit in their seats when we played our first unison chord with even more youthful energy than usual. The rest of the concert was a bit of a blur. 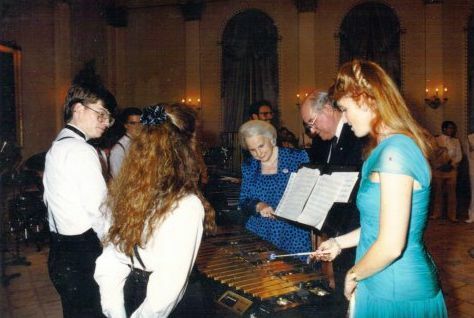 When it was over, we had a few minutes to talk to the Duke and Duchess about the instruments and how they worked. 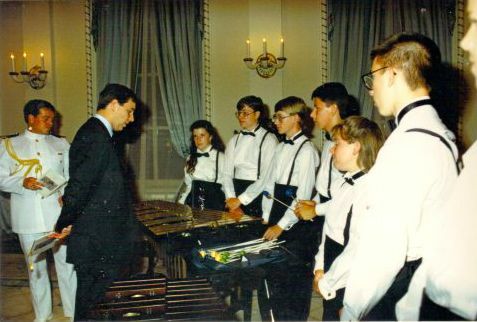 Prince Andrew checking out the vibraphone. That’s me, fourth from the left. I know, I totally rocked the bow-tie-and-suspenders look. Fergie takes a turn while Jeanne Sauvé looks on. I, on the other hand, appear to be checking out the royal bosom. The final guest to leave was Elizabeth Manley. Truth be told, meeting her was the highlight for most of us. She was arguably one of the most famous Canadians at that time, and was exceptionally cute in a pixieish kind of way. In my old age I’ve become a lot more cynical about the whole royal visit. I skipped going downtown on Canada Day to avoid the huge crowds who turned out for a fleeting glimpse of Will & Kate. Then I thought about how monumental that brief encounter with celebrity seemed 22 years ago and lightened up. I’m sure meeting the Duke and Duchess is a big deal for many people, both young and old alike, and I hope lots of them get to fulfill that wish over the next few days.